Kids are drawn to the sea world because of the variety of fish and other life forms. Among the sea creatures of the deep that get the most attention is the octopus. It is widely regarded as the most intelligent creature among the other invertebrates. Your kid may already have a fascination for the octopus because of its large tentacles and gigantic head – the size of a football. 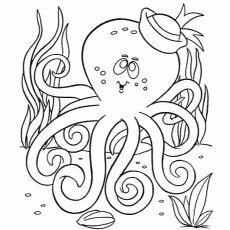 These octopus coloring sheets will expose your child to the fascinating underwater world where the octopus thrives in all its magnificence. Also, this activity allows you to impart a few interesting facts about the octopus to your kid. 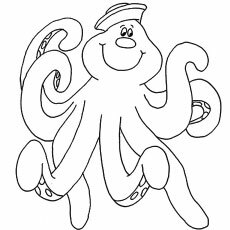 The octopus coloring pages printable showcase the sea creature in all its glory. 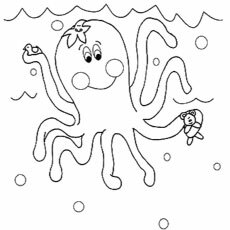 Also, these octopus pictures to color are apt for children from the age groups of 4 years and above. The picture highlights the octopus showing off its tentacles under water. Two of the octopus’ tentacles are in fact used for movement. This picture is apt for children who are just beginning to color. 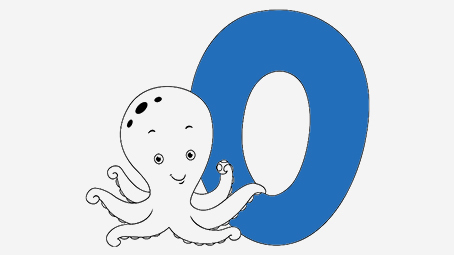 This picture shows a beautiful octopus encompassing the alphabet ‘O’. The octopus has a large bulbous head which helps propel it when it swims in the water. 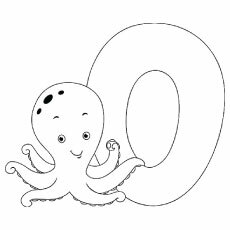 Your kid will learn about a letter of the alphabet – ‘O’; will also learn to differentiate between big and small vowels. This picture showcases the octopus surrounded by other creatures of the sea. Octopuses are extremely flexible sea animals and can fit their bodies through incredibly small spaces. Let your kid choose bold hues to color the other surrounding fish and sea weed in the picture. 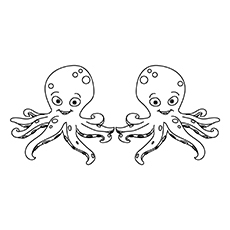 This picture showcases two octopuses in opposite directions. Octopuses have the ability to swim backwards because of a certain muscle which is present in their body. This picture is apt for children above the age of 7 years. It will help your kid gain a better sense of direction – distinguishing left from right. 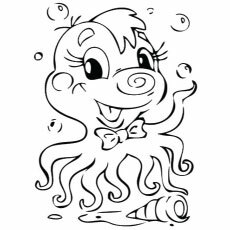 The coloring page shows the octopus staring back with big eyes and large tentacles. The octopus amazingly has three hearts – two to pump blood through the gills and one to pump blood to the rest of the body; the color of its blood is blue. This picture will help your kid focus on small details when coloring. Has your kid ever seen an octopus wear a sailor hat, ever? Now he will. Sailors traversing the tricky ocean waves have always been wary of encountering octopuses who have the ability to destroy a ship with their tentacles. The dark outlines of the picture will help your child color within the lines. 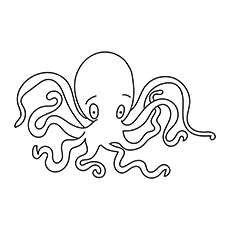 This picture highlights an incomplete octopus that requires your child to draw the rest of it. This picture will also test your kid’s drawing skills as he will be responsible for completing the rest of the picture. You draw small dots and ask your kids to connect them to complete the picture if he has trouble drawing on his own. This picture showcases various creatures that stay beneath the surface of the ocean. 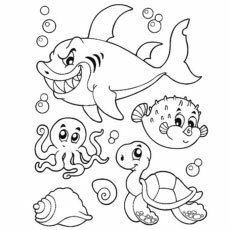 Your kid will be able to relate to the picture as it contains a few other famous sea creatures including the shark, sea turtle and puffer fish. This picture showcases a pretty Octopus Girl with a beautiful smile. The female Octopus can lay around 150,000 eggs in a span of two weeks! Your little girl will enjoy coloring this picture; she can use glitter to accent it further. This image is fun as the octopus is shown with his friends – the duck and teddy bear. The octopus can also be kept as pets! The cute image will leave a lasting impression on your kid. 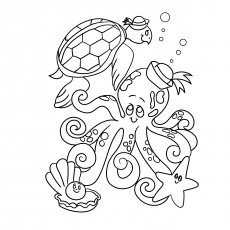 These free printable octopus coloring pages online will definitely pique the interest. 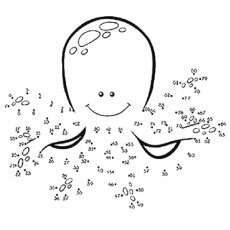 of your kid because it showcases some interesting shapes which make the octopus a well-loved sea animal. 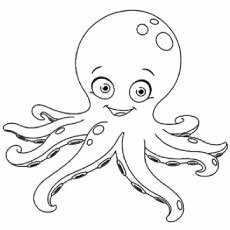 Do share your views on these octopus coloring pages to print in the comment section below.